As noted on our home page, lender liability claims arise when a financial institution or fiduciary violates a duty of good faith or fair dealing to its customer / borrower or has assumed such a degree of control over the borrower that it assumes a fiduciary duty. Breaching a fiduciary duty that the lender may have assumed with respect to the borrower. The lender – borrower relationship often begins when the borrower submits a loan application. The law, however, was that the lender owed no special duty during the application and origination process. Only when a commitment letter was issued was there the potential for the borrower to sue the bank under some theory of lender liability. Things have changed a bit in recent years. Until the last two decades, banks that issued loans used to keep and service their loans. Now many lenders originate loans only to sell later securitize and sell them. With the radical change in banking relationships came a change in lender liability theories. As market conditions change, some lenders will claim their loan commitment isn’t enforceable because it lacks certain terms. Banks will also attempt to add new and onerous conditions simply to force the borrower to walk away from the loan. Is the loan commitment or promise to loan money oral? Please visit our cornerstone page on oral loan commitments. Many times a bank will renew demand notes or short term notes and then suddenly and for no valid reason demand a business owner pledge his or her home or sign personal guarantees. The beleaguered business owner is then forced to accept the onerous terms since there is no time to secure alternate financing. The language in loan agreements invariably favors the bank. However, all is not lost! The bank’s prior course of conduct and implied covenants of good faith and fair dealing can sometimes be successfully used to stop a bank from simply deciding in the 11th hour not to renew a loan or suddenly demand more guarantees or collateral. See also our cornerstone page on oral promises, failure to renew loans and lines of credit. Today’s commercial loan documents often contain 1000 or more pages. If the loan is part of a securitized portfolio (commercial mortgage backed securities), the pooling and servicing agreements are often over 600 pages. Contained in the fine print are hundreds of clauses, usually always drafted in favor of the bank and against the borrower. It is entirely possible to be commit numerous defaults even though no payments, taxes or insurance payments were ever late. Some lenders encourage borrowers to default simply so the loan can be transferred into special servicing. There is usually a promise that better terms can be negotiated once a loan is in default. Unfortunately, some lenders and servicers use negotiated or technical defaults as a way of acquiring the property for their own portfolio or generating millions of dollars in default interest and fees. There is good news for borrowers, however. Courts can readily distinguish between a payment default and a technical default. With the proper lawyer, it is possible to hold banks responsible for bad faith foreclosures or acceleration demands, especially when an alleged “default” by a borrower is not material. If you feel backed against a wall, give us a call. 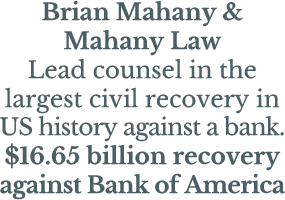 We can help even the playing field and even turn the tide against aggressive lenders. Since 2007, there have been hundreds of thousands of foreclosure cases filed in the United States. Gone are the days when courts simply rubber stamp the bank’s foreclosure paperwork (although pockets of judicial inattention persist.) As a result of this flood of cases is an evolving body of wrongful foreclosure case law. Loan documentation has become so complex and banks so inept that in many cases we find that banks have failed to comply with their own notice requirements or those established by state law or ordinance. Some courts have ruled that lenders must provide advance notice before calling a loan due or declaring a default. This is especially true with demand notes that on their face suggest a lender can call the loan at any time. Virtually every loan document contains an acceleration clause. These provisions allow the lender to accelerate all amounts due under the loan. The entire balance comes due instead of just the missed payment. The most typical acceleration clauses are found in the loan’s default provisions. For example, a payment default accelerates all future payments due under the loan. Let’s say you have a 240 month loan term. In month 80 you miss a payment triggering the default clause. Because you are in default for that monthly payment, the lender can demand not only that month’s payment but the next 160 months of payments as well. Most borrowers accept that if they miss a payment, in most instances the lender can declare the loan in default, accelerate the remaining balances and pursue collection remedies. The trickier cases involve alleged defaults because of an insecurity clauses and non-payment defaults. Defaults in loans with grace periods can also give borrowers additional rights and leverage. Loan documents are usually written by the banks and other lenders. They are skewed in favor of the lender and against the borrower. Often borrowers don’t review the boilerplate language in their loan agreements. Even if they do, they often don’t have the clout to make changes even when they catch some of the obvious drafting biases and wordsmithing contained in the loan documents. One of the areas causing the most concern in loans documents is the so-called insecurity clause. An insecurity clause allows the bank to accelerate the amounts due when it feels insecure. If that sounds rather draconian, it is. An insecurity clause is designed to protect the lender from actions by the borrower which jeopardize or impair the lender's security. Often a lender will have a change in management, loan officers or business focus. When that happens, some lenders try to rid their books of loans they don’t like or no longer write. How do they try to do this? Often it is with an insecurity clause. Despite the broad language typical to most insecurity clauses, banks cannot use them offensively. It is illegal for a lender to trigger an acceleration clause solely for its commercial advantage. The obvious and most typical default occurs when a borrower misses a payment. Many loan terms permit lenders to declare a default if other terms of the loan are breached. Similar to the insecurity clauses above, often the determination of whether or not a loan is in default is strictly in the eyes of the beholder. Most commercial loans have provisions that allow the lender to accelerate if required collateral falls below a certain value, if the tenancy in a commercial building falls below a certain percentage or if certain asset value ratios are not maintained. But who determines the value of collateral or if a ratio isn’t met? Who determines if these alleged breaches – assuming there is even a breach – are material? 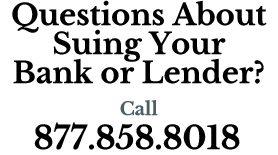 These questions give the borrower ample ammunition to fight back and even sue their bank. Today many courts have ruled that mere technical violations are not enough to declare a default, especially if the default isn’t material. Similarly, courts have ruled in favor of borrowers in cases where banks have made verbal assurances of working with the borrower only to pull out the rug and suddenly declare a default. Closely related to improper acceleration demands, banks also have good faith obligations when demanding extra collateral or additional guarantees. We often see cases where a bank improperly declares a default, accelerates the loan and then holds out a tiny bit of hope in the form of a forbearance agreement. There is a catch, however… the bank will forbear collection but only if the borrower pledges more collateral or personally guarantees the loan. Sometimes the lender will repeat this same process multiple times simply so it can exert control over all of the borrower’s assets. The language in most loan documents is draconian. Even though it often looks like all the cards are stacked in favor of the bank, borrowers can fight back by showing the lender’s behavior violates the Uniform Commercial Code, general principles of equity and fundamental fairness and the covenant of good faith. It is possible to sue a bank and win and to stop wrongful foreclosures. Lenders generally have the ability to protect their interests in collateral but can improperly exert undue control or interfere with the borrower’s contracts with third parties. Sometimes a bank’s interference is deliberate and sometimes it is negligent. Borrowers frequently have contracts with vendors and customers. If a lender thinks it’s loan position or security is in jeopardy, it will act to protect its position. Some banks, however, overreach. That is when problems occur. Can a bank dictate a borrower’s other banking relationships? Can it order a borrower not to fulfill a contract the bank thinks is unprofitable? Can a bank meddle in its borrower’s day-to-day activities? Direct what bills get paid? Some courts have said no. It’s bad enough when a bank puts undue pressure on one its customers but even worse when a bank meddles so much that it puts the company at risk of losing key employees and customers. A series of court decisions have ruled that banks simply can’t take over a borrower’s management team and board of directors. The problems today exist on the margins. Just how far can a bank interfere with management? Today banks often try to push their limits by forcing customers to hire certain specified consultants, consultants that the customer (you) must pay. These same consultants must also approve every expenditure. Thankfully, courts can be convinced that banks shouldn’t be allowed to do indirectly what they can’t do directly.